Heat a skillet, add little oil/butter/ghee and add caraway seeds, the spices and saute for 30-40 seconds. Add the onions and then ginger-garlic paste and saute some more till the aroma starts hitting the nostrils. Add the chopped tomatoes, tomato puree, tamarind paste and cook till the raw smell of the tomato leaves and it becomes soft and mushy. 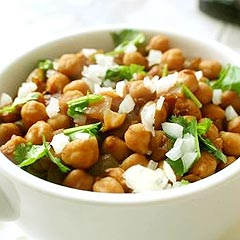 Remove the tea bag and bay leaf from the chickpeas and then pour down the remaining content into this onion-tomato mixture. Add more water if needed. Bring it to a boil and smash down few chholle to thicken the gravy.